Click on the add *ADD to CART* button at the above right to purchase the kit and confirm you seat in the Boxboro Buildathon. Your kit will be waiting for you in the Buildathon room on Saturday night. Of course, You can also purchase the kit and take it home to build if you want. The Buildathon price is a discounted price from the regular website item and also reflects NO shipping charges. A deal for you but only if you show up at Boxboro! Bring a kit building tool set if you have one. If you do not have any tool, please give me a heads up!! I have some spare tools but they need to be split between this Buildathon and another in my home town with a hundred or two Boy Scouts building a custom Night Sender Key I designed for the camporee. The majority of my Buildathon tools will need to be at the camporee. 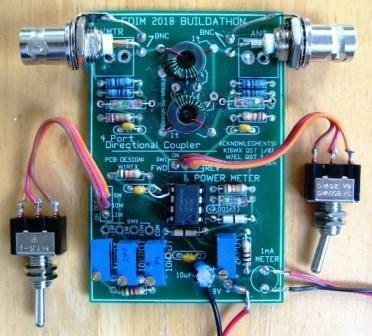 We will be building a QRP Directional Power Meter at the 2018 Boxboro NEQRP Buildathon. It is a much improved kit from the one we built at the 2018 FDIM Buildathon at Dayton to make it a much more universal tool for QRPers benches. Keeping with the bench instrumentation theme over the past few years, the project for the FDIM 2018 Buildathon was a Simple and Accurate Directional Wattmeter for measuring forward and reflected power. Once you know the two powers, is is an easy calculation to obtain the true VSWR. The project that we built is an updated version of Roy, W7EL, Lewallens Simple & Accurate Directional Wattmeter from 2/90 QST. After I returned home from FDIM, I sent a couple of kits down to Chuck Carpenter, W5USJ, for experimenting and creating a more detailed documentation portfolio. Chuck has worked for a couple of weeks and come up with some very thorough sheets! First and foremost, he did lots of measuring and experimenting and discovered that the 4 Port Direction Coupler used in this design did not produce as much output voltage as the microstrip line coupler used in the W7EL design so a new adjustment and calibration procedure was required. (The kits built in the FDIM Buildathon need to be readjusted to compensate for the lower output from the coupler circuit. Please review all the v3b documents under the 2018 Buildathon ITEM to see all the updates required to make the Buildathon kit operate fully. I decided to make some changes to the Buildathon kit for a more universal appeal. Included changes are: BNC connectors instead of RCAs, a full set of trimmer pots for easy range adjustment, panel mounted switches to make the kit easier to put in an enclosure SUPPLIED BY THE BUILDER. All you need to add is an enclosure and an appropriate meter. I found a nice little meter for about 7 bucks on Amazon. You can buy them cheaper with shipping from China or fulfilled by Amazon for a little more money. Mine came from Amazon and arrived 3 days after ordering it. The QRP-DWM presented here is a nice piece of test equipment that should be welcomed on every QRPers bench. Click on the BUY button at the above right to purchase the kit and confirm you seat in the Boxboro Buildathon. Your kit will be waiting for you in the Buildathon room on Saturday night. Of course, You can also purchase the kit and take it home to build if you want. The Buildathon price is a discounted price from the regular website item and also reflects NO shipping charges. A deal for you but only if you show up at Boxboro!